Do you wish to change the taste of your tongue and wish to relish something modernistic then you must try cooking “Traditional Bruschetta”. This is a famous Italian starter. If you are a food enthusiast, then you will definitely love this dish. Italian dishes are anyways favorite of many. If you are bored of eating the routine dishes every day, then you can try out something new and authentic. 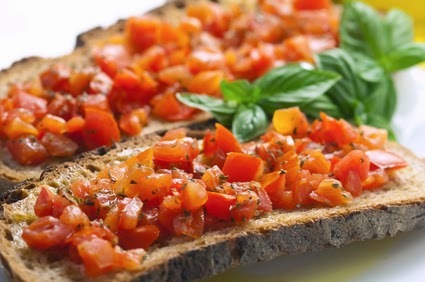 The recipe of Traditional Bruschetta is very simple. The preparation procedure is easy-going. If you wish to make something new for your family, then this dish can term out to be a special one. This Italian starter is prepared by using bread slices, the slices of bread are coated with garlic steeped olive oil, after which the bread is toasted and topped with a delightful assortment of garlic, basil, tomatoes, red wine vinegar or (lemon juice) and shallots. This dish can be taken evening snack or a starter. Chop the tomatoes, garlic, red onions and put the mixture into an average sized vessel. Place the mixer aside and then wash and chop the basil leaves, keep on cutting till the leaves are finely chopped. Once, the chopping is done, add them to the mixture that is placed in the container. Add olive oil, salt pepper and red wine vinegar and Stir well. Once the mixing procedure is completed, place the container aside. Meanwhile, Toast or grill the bread until it becomes crispy and light brown. It is a unique snack for parties and for other special occasions like festivals, casual get-togethers etc. If you have kids in your house, then it is for sure that they will enjoy having this dish. You might have got bored of eating the usual dishes such as pasta, burger and pizza. If enjoy having fast food, then this dish will definitely make you and your loved ones happy.